Buncombe County is situated where the Great Smoky Mountains and the Blue Ridge Mountains meet, 2,340 feet above sea level and is home to some of the finest real estate in North Carolina. As of the 2000 census, the population of Buncombe County was 215,680 people, and it is one of the fastest growing counties in Western North Carolina. This may be because the surrounding area is so beautiful that real estate in the Buncombe County area is always in high demand. No matter where you live, you can enjoy views of the mountains. The wide variety of housing possibilities is also a big draw for people looking to relocate. There are single family homes, suburban homes, Victorian style homes, mountain homes with spectacular views and urban townhouses and condos. For something more unique, there are also restored historical properties. While the county seat of Asheville is well developed, there are plenty of rural areas just outside that allow for a blend of urban and rural lifestyles. This makes Buncombe County the perfect place for people who want small town charm as well as the culture, diversity, and night life that only Asheville can offer. 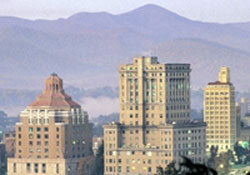 Successful growth is the key to Buncombe County’s popularity. Each year we enjoy a steady growth in employment, low crime rates, and increase in per capita income, and an influx of good people who help make our community a better place to live.